There will be a choice of two walks. They both start from the door of the hotel, and we will ask you to choose the previous evening. We will leave Sidholme immediately after breakfast, preferably by 0915. Sue V will be leading this walk. The walk is to the east of Sidmouth, and is 4 miles. There is one significant climb on the coastal path, but it is easy underfoot, and it is worth it for the views. The descent is mostly on steps. The final part of the walk follows the River Sid through a long linear park called The Byes, and is very easy. Click for a map of the walk. We will leave Sidholme immediately after breakfast, preferably by 0900. Arnold will be leading this walk. 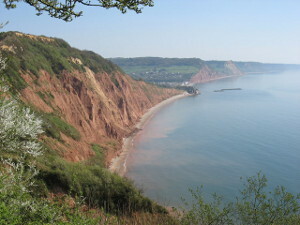 The walk is mostly to the west of Sidmouth, and is 6 miles. The hills are more demanding than on the 4 mile walk. There is a long easy stretch along the Promenade, followed by a major ascent up the coastal path, after which we pass through woodland before returning to Sidmouth by an easier route. Click for a map of the walk. You can have lunch at the hotel, but if you want to spend the afternoon in Sidmouth, you will find a wide choice of pubs and cafés. Dinner will be at 1900. Nothing has been organised for the evening, but you could play table tennis, snooker, or board games.